Loretta Elizabeth Lynch (born May 21, 1959) is an American politician. She was the 83rd Attorney General of the United States from April 27, 2015 to January 20, 2017. Before, she served as United States Attorney for the Eastern District of New York from 1999 through 2001 and again from 2010 through 2015. 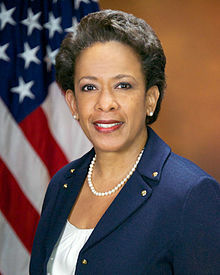 Lynch was nominated by President Barack Obama on November 8, 2014. Her appointment was confirmed on April 23, 2015 by a 56 to 43 vote. Her nomination process was one of the longest in the history of the United States, taking 166 days after she was first nominated for the post. ↑ "Attorneys At The Succeeding In Spite Of Top Dismal Diversity Trends". tnj.com. ↑ "U.S. Senate: Roll Call Vote". senate.gov. January 27, 2015. ↑ "Loretta Lynch confirmed by Senate as attorney general". ↑ "Senate Confirms Loretta Lynch as Attorney General 166 Days After Nomination". ABC news. Retrieved 27 April 2015. This page was last changed on 31 August 2017, at 06:59.